For the past few months I've been trying out a whole bunch of different topcoats and basecoats and I think I've found a few new loves (but that's for another post!) but I've also found a few losers. Here's Redi topcoat on day two over a manicure of China Glaze... something, I forget actually... with a coat of the Goldie blue jelly glitter on top. A little tipwear but no chips. Note the nail art. It was not really intentional, I had to cover up a chip on the right hand because I was too lazy to re-do my manicure (but hey, I shouldn't have to re-do on day one anyway!) and I did the left hand to sorta match. Here's Diamond Dry topcoat on day two over the same polish. The polish on the entire corner of the ring finger nail chipped off hours after applying. But, the Redi topcoat didn't chip at all. How insane is that? Ironically, it was the Diamond Dry topcoat I was most excited about trying and it turned out to be the worst one. Ugh. Now the Redi topcoat... I love it. A lot. I think it's going to be my new Seche Vite. I'll save that review for later, I just wanted to show these funny pictures. That stinks! Such a pretty manicure ruined all because of a cruddy top coat. Nice combo m'love! Might have to try that! Gotta get my hands on "China Glaze Something" first. Sounds intriguing. Is it new? Actually, I kind of like your little chip-cover "art" it matches. I'll have to take a peek at Sally's if I ever get to go. I would totally do that chip cover up look as a purposeful nail art venture on day one. Very cute! I love behind the scenes posts like this, I'd love to see more! Wow, I can't believe the Diamond topcoat sucked so bad!! I'm anxious to read your full review of the Duri one. I'm always on the lookout for new stuff! I also use the redi top coat and I love it, it dries your nail super quicly and prevent chipping, aslo the price is so good! I love this post, I've been looking for a good base-coat and top coat combo.. I've read that buffing your nails and then painting them can make a manicure last for 7 days chip free, but I'm worried about staining my nails..
Great timing! LOL I just got my package that included Seche Vite yesterday. I tried it out and it works really well, but I'm already looking for a replacement because I don't want to use something that has carcinogens in it. D: I kind of thought it's big3 free since people love it so much only to get it and see that it has toluene! DDDDD: No thanks! Where can I find the Redi top coat? Love the chip cover mani art! I tend to do a line of glitter across my tips as a sort of reverse French when they start to wear, disguises it really well. So would you rate Redi over Seche Vite? And have you tried the Poshe topcoat, how does it compare? I seem to have real trouble with all quick dry topcoats, every single one chips the following day. After reading your post I'll give Redi a try next and see how that one fares on me! Hi Scrangie! Looking forward to your Redi topcoat review! I'm reall interested in reading it because I'd like to try Redi too. I hope you're feeling better. Take care! Thanks for the great blog. That happened to me with the Sephora by Opi top coat. Weird. I have had the same problem with Diamond polishes and topcoats; no matter what I do they chip like mad! I like the art to cover up chips...I would probably just change polish, but this is a cute alternative. I think the polish is Custom Kicks, no? Thanks for the tip about Redi...I may look into that, but I have had great luck with Nubar Diamont and Sally Hansen Insta Dri, so it may be something to try after I run out of those. the color of "china glaze something" looks like aqua baby to me, a deep turqouise that looks a little bit dirty in my eyes. I've been trying out different top coats, too, since I want to avoid non-big-3-free polishes, but nothing is as fast drying as seche vite or essie good to go. all my big-3-free fast drying topcoats take way longer and the polish stays soft for hours. by the way, have you seen the new color changing mood polishes at claire's? Oh! I can't wait to see what your review is of the Redi TC! I'm so ready to leave SV, but I haven't found anything I love as much. Glad to see you're back (I hope)! Can't wait to see your top coat findings, I use seche, but I am not in LOVE with it! Always looking for what will allow me to keep my polish longer! Can't wait to read the full reviews. Also, I am glad to see you posting again. As for topcoats, recently my 80 something year old mother started getting her nails done at the hair salon where she lives (she lives in a condo in a big city). She had never had a manicure and it was the second one she had. I asked her how her nails looked and if there was any chipping prior to getting the second manicure. She said there wasn't any chipping. I said, "none?" No, she said, no chipping. With great eagerness, I told her she had to find out what kind of topcoat they used on her natural nails. Without missing a beat she said, "My nails don't really get chipped when all I do (all day) is to move from one end of the sofa to the other." We had a good laugh over that one. Hopefully when I am in my eighties, I won't do a whole lot either. The difference between the two top coats is glaringly obvious. Looking forward to your review later on! Yay! I love this idea a lot. I hope you do one for base coats soon. I'm forever searching for a base coat I like. 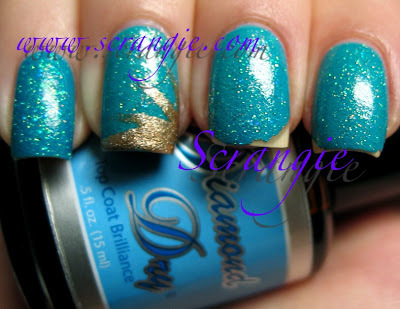 I LOVE that you did a post on topcoat! Just the other day I was posting about some of my favorite OPI's and asked if anyone knew how in the world to keep color from chipping and a reader recommended your site!! I hate having a new manicure ruined by chips and it's because of that that I don't do manicures often. Do you have any other products or secrets to keep color from chipping? Also, where can you buy Redi? I tried googling and didn't find it. What do you think of the OPI topcoat? Sadly none of the topcoats you mentioned are available where I live... So I'm sort of stuck with OPI. The reviews on MUA aren't so great, but I'd rather seek "professional" opinion from you! I've been experimenting with several Sally Hansen topcoats. One that promises 30 second drying time has been a failure of epic proportions for me (smudges everywhere). Yet, another version of SH's topcoat, promising quick (but not 30-second drying) has been my go-to for the last year -Loads of shine and good protection! I have another quick-dry top coat by Northern Lights. It's only so-so and seems to encourage chipping on my best nail polishes within 2 days. I only kept it because it adds a slightly holographic topcoat that is so pretty. I love your creative way of covering up chipped nail color. I need to try that soon. Hmmm maybe it's China Glaze Custom Kicks? I've been back and forth on that polish for ages so I sort of recognize the color. I tried Diamond Diamond Dry & also did not like it - I got terrible shrinkage! Love the manicure. My favorite topcoat is Nubar's Diamont. I have tons of topcoats so I have to use them up. Scrangie, I've had more pulling at the tip with Sêche than I've had with Dazzle Dry. I read in the previous entry you like the Zoya remover. Have you tried the one from SpaRitual? I got a sample of it when we were thinking of carrying that line in my salon and I fell in love with it. Nice, pleasant aroma and not drying at all.